Honor View 20 has now been officially launched in India Today and is now made available to the Indian customers. Earlier it has been launched at an event in Paris on January 22, 2019. Its base variant is priced at INR=37,999. It is the global version of the Honor V20 that was initially launched in Hong Kong and China markets on December 10 and December 26 respectively, in the previous year. The Honor View 20 is the company's first smartphone that comes with a hole- punch display for the selfie camera which is the key highlighting feature of the device. 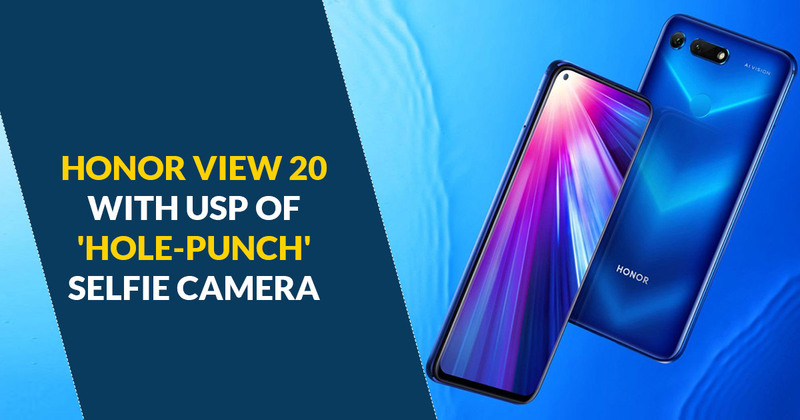 Apart from the hole- punch display, the Honor View 20 features a 48-megapixel Sony IMX586 sensor and a second time of flight (ToF) sensor on the rear panel. It has been embedded with a 4,000mAh battery and runs on modern Huawei's flagship-grade HiSilicon Kirin 980 SoC which is coupled with up to 8GB RAM. The Aurora Nanotexture pattern at the back of the smartphone forms a V-shaped design when light reflects on its surface, thus enhancing its beauty. The Honor View 20 is priced in India at Rs. 37,999 for the 6GB RAM/ 128GB storage variant, while Rs. 45,999 has been fixed for its other variant having 8GB RAM/ 256GB storage option. The smartphone is coming in three colour variants - Phantom Blue, Midnight Black, and Sapphire Blue colour options. Amazon.in and HiHonor Store would be the retailers for Honor View 20 in India starting 12 am (Midnight) IST from Wednesday, January 30. Whereas, from February it would also be sold via Reliance Digital. After being officially launched in China as Honor v20, last week the smartphone was announced in Paris and France priced at EUR 569 (roughly Rs. 46,200) or GBP 499 (roughly Rs. 46,600) for the base 6GB RAM and 128GB storage variant. The Honor V20 features a display hole that houses selfie camera and it is positioned on the top left corner of the screen. The display hole is just 4.5mm in size which is very micro that even can’t be visible properly, claims company. It has a slighter bezel on the top and bottom edges of the device and features a full-screen display. The earpiece provided with this set is almost hidden along the frame situated at the top to deliver to its customers, a nearly full-screen experience. The smartphone comes with dual rear sensors which are positioned horizontally as well as a rear-mounted fingerprint scanner. We can see that the rear panel features a glossy gradient finish design and narrow edges for the better handling. Just like the many other competitive models, the Honor View 20 carries a 3D ToF sensor at the back of the phone that enhances depth details as well as enables 3D and AR-style apps. It also has a PC Mode which offers a desktop-like experience when connected with a monitor, keyboard and a mouse. The Company facilitates its customers by offering Honor View 20 preloaded with an AI Video Editor app and an AI Shopping visual search technology. Honor View 20 which is a dual-SIM (Nano), runs Magic UI 2.0 on top of Android Pie and features a 6.4-inch full-HD+ (1080x2310 pixels) TFT LCD All-View display. The aspect ratio being 19.5:9 and 91.82 percent screen-to-body ratio. The pixel density of the smartphone measures 398ppi. An octa-core HiSilicon Kirin 980 SoC, coupled with 6GB and 8GB RAM options is placed Under the hood. For thermal management, there is a liquid cooling system. Talking about the optics, the smartphone Honor View 20 has a dual rear camera setup which has a 48-megapixel Sony IMX586 sensor and an f/1.8 aperture. There is 960fps slow-motion video recording facility, autofocus, AI HDR, and an LED flash module. The set is also equipped with a 3D ToF sensor. Again for the selfie lovers, the smartphone offers a 25-megapixel camera sensor at the front having an aperture of /2.0 and a fixed focus lens. On the Storage front, the Honor View 20 has 128GB and 256GB of inbuilt storage options, but the phone does not support a microSD card slot for expansion of storage. For connectivity, the smartphone has 4G VoLTE, Bluetooth v5.0, Wi-Fi 802.11 a/b/g/n/ac (dual-band, 2.4GHz and 5GHz), GPS/ A-GPS, and USB Type-C along with a dual-frequency GPS and triple-antenna Wi-Fi features. The View 20 is powered by a 4,000mAh battery which supports fast charging (4.5V/5A) as is trending.